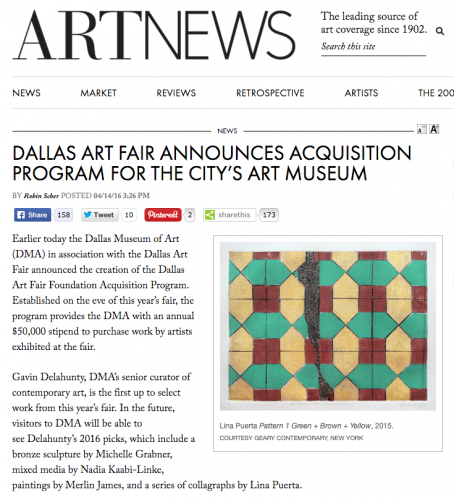 Earlier today the Dallas Museum of Art (DMA) in association with the Dallas Art Fair announced the creation of the Dallas Art Fair Foundation Acquisition Program. Established on the eve of this year’s fair, the program provides the DMA with an annual $50,000 stipend to purchase work by artists exhibited at the fair. Gavin Delahunty, DMA’s senior curator of contemporary art, is the first up to select work from this year’s fair. In the future, visitors to DMA will be able to see Delahunty’s 2016 picks, which include a bronze sculpture by Michelle Grabner, mixed media by Nadia Kaabi-Linke, paintings by Merlin James, and a series of collagraphs by Lina Puerta.